Just after GUADEC, I made some general comments about this whole “online desktop” idea that was nicely presented by Havoc and Bryan in Birmingham. My main argument is that we should not have a separate “online desktop mode” but try to turn our desktop into a web-aware environment. 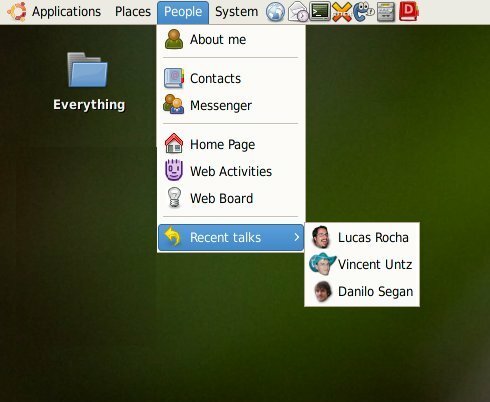 Now that Empathy has been proposed for GNOME 2.22, I think it’s time to start thinking about interesting ways of integrating the instant messaging stuff and online desktop stack in the desktop (note that there’s no garantee that Empathy and online desktop will be accepted as official modules but, as a strong supported, I still think it makes sense to bring those ideas at this moment). In my opinion, we should take advantage of the fact that Empathy is a framework-ish aproach for instant messaging (not simply a standalone application) to bring a seamless integration of its features in the desktop environment. So, I had this idea (that should be more detailed and discussed) of a possible (and feasible) way of integrating Empathy and online desktop stuff in the desktop: a People menu in main menu bar. This is just an initial/rough idea with the aim of setting some kind of direction on how we could integrate instant messaging and online desktop in GNOME. There are still many things to discuss and decide.